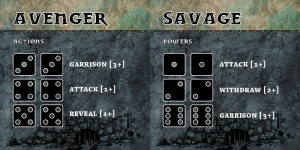 SoulJar has a new class they're voting on over in their Dice Crawl Kickstarter. They're also getting ever-so-closer to their goal with still 2 weeks left to go. Another great day in the Dice Crawl kickstarter, my dear backers! We are even closer to funding (just $400 at the time of writing .... ooooh, can you feel it? ), we're only 31 backers from a new race, and today we got enough shares to unlock a new class! So with the new class vote opened (see below), we have locked down the previous vote which was between the barbarian and the explorer. The explorer took it hands down, so all boxed sets (the game, dice or not) and above get this card added completely free!